Confession: I’ve never eaten carrot halwa in India. Yet it is one of my favorites – and a dessert I’ve been making for nearly two decades. It’s a good thing I live with someone who knows how it ought to taste and can veto any adaptations that go too far. But I still think it’s safer to call my version carrot pudding. 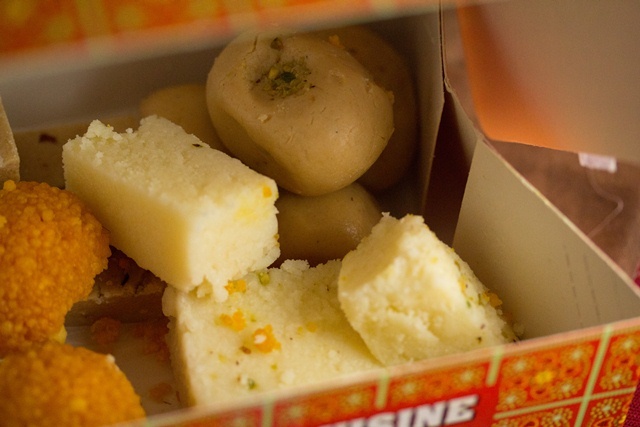 Indian sweets are a special treat. 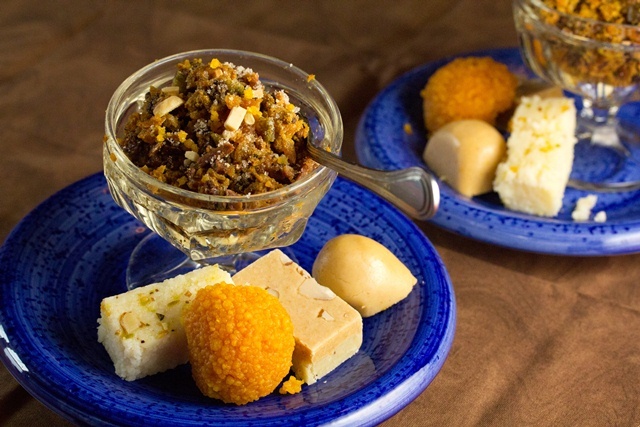 A few of my favorites include kalakand, laddu, pesta barfi, and peda – we don’t buy them very often, (though there are local sources) and I have yet to attempt to make them. When my Mother-in-law comes to visit with a box or two, we cherish them till every bite is gone. 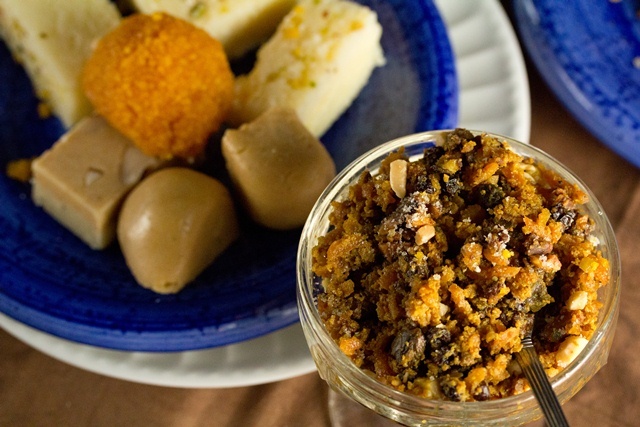 And at least a few times a year, though, I make Carrot Pudding with Raisins and Pistachios. This recipe is the essence of slow food. Reduce, condense and sweeten the milk, slowly cook the carrots while the liquid evaporates, and finish the dish with pistachios and raisins. It’s a two hour process, at a minimum. So this too, is a special occasion treat. (I start with whole milk. My mother-in-law starts with canned sweetened condensed milk – and uses far fewer carrots than I do. Her recipe is still a project, just a slightly shorter one.) Some years I make halwa for K.M.’s birthday, or sometimes – like right now – simply because carrots are the most exciting thing at the farmers market. My halwa is heavy on the raisins and nuts, (which makes the color so dark) and not as sweet as the traditional version. And I often use black cardamom seeds, rather than the green. It’s a pretty flexible formula – if you want a bright orange pudding, just cut back on the dried fruit. If you want a visually stunning halwa make it with super sweet red carrots. You can even mold it into shapes, rather than leaving it free form, the way I do. 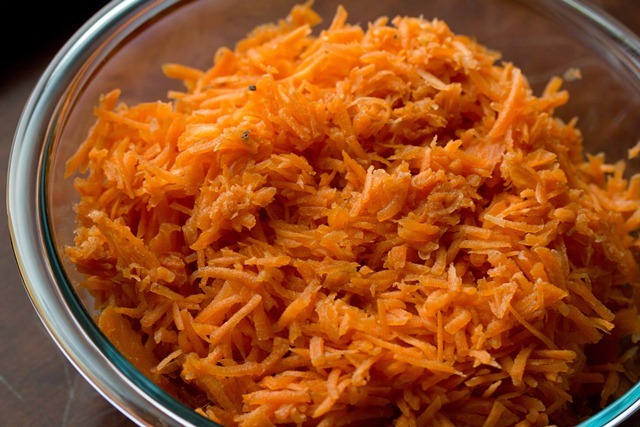 Some recipes start or finish the process by frying the carrots in ghee, but I skip that step– the carrot flavor comes through better without the butter. Serve it at room temperature, or just a little bit warmer. Try topping it with vanilla ice cream. You can even eat it for breakfast, with yogurt, the way I did today. The next time I travel to India, eating gajar halwa goes to the top of the to-do list. But until then, carrot pudding will do the job. 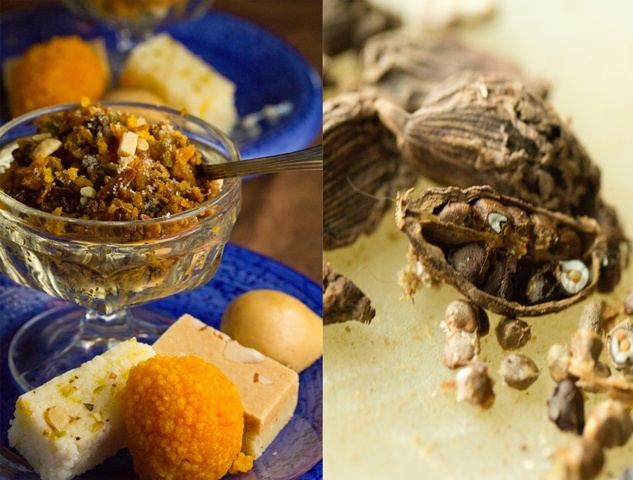 I’m adding this post to Indianfoodpalooza – an event hosted by Barbara of Creative Culinary, Prerna of Indian Simmer, and Kathy at The Colors or Indian Cooking. The event runs till the end of March – so far, more than 60 bloggers have contributed some amazing looking Indian recipes. Don’t miss the list of links! oh, I will remember this when I have a windfall of carrots. we did this past winter, so sweet and delicious! 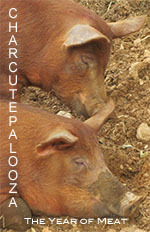 thanks for sharing Indianfoodpalooza too. I posted my naan recipe! I made an Indian dinner centered around a lamb curry (local lamb of course, raised by a friend). I made the carrot pudding with last season’s dried cherries. a nice sweet treat with or without the ice cream! I’m so glad you liked it. It’s what I make for KM instead of birthday cake!